Ear Infection Treatment: When Does Your Child Need Ear Tubes? Consult with a physician if your child is experiencing chronic ear infections due to persistent inner ear fluid buildup. Practically all children have one or more ear infections by the time they reach the age of five, but if those ear infections recur again and again, or if your child is subject to fluid buildup, your pediatrician may recommend that your child should have ear tubes installed. It’s dangerous to have fluid buildup in your child’s ears because it can eventually lead to hearing loss, and cause considerable discomfort as well. When your child doesn’t respond to other treatments for ear infections, ear tubes just might be the answer, and they can prevent the possibility of incurring long-term problems with hearing. Why are There so Many ear Infections? Ear infections occur when bacteria or viruses accumulate in your child’s middle ear, which is situated right behind the eardrums. Children are far more prone to developing ear infections, simply because their bodies are still growing and changing, at least far more than adult bodies are. The way that fluids drain out of the ears is via the Eustachian tubes, and for kids, those tubes are smaller and nearly parallel to the ground, which means gravity has less effect and the ears won’t drain very well, even if your child is healthy. When Eustachian tubes get filled with mucus, often as a result of catching a cold, that lack of drainage becomes crucial, because bacteria can thrive in the Eustachian tubes, and that can lead to the development of infections. Of course, for some kids, it just happens a lot more than for others, but it occurs far more with children as a general group, than it does for adults. When an infection develops in the Eustachian tubes, the fluid has a greater opportunity to build up in that portion of the middle ear, creating much more pressure and pain than normal. This is when you will observe such symptoms as fluid dribbling from the ears, difficulty sleeping, tugging at the ears, balance troubles, and much more fussiness or irritability than usual, particularly when your child is laying down. Children can experience a weak functionality in the Eustachian tubes, which normally allow fluid to drain from the inner ear, leading to infection. When Does an ear Infection Require Treatment? Initially, your doctor will probably await further developments, to see if the infection subsides on its own, particularly if it was triggered by a virus. In other situations, it may be necessary to treat the child with antibiotics in order to kill an infection. However, there are a great many children who develop infections that simply won’t clear up on their own. For the most part, these won’t really lead to any lasting hearing problems, but if ear infections occur frequently, you may run the risk of developing hearing loss, experiencing delays with speech development and with social skills, physical holes or tears in the eardrum, and it’s even possible that an infection could spread throughout the head. Some of the best candidates for ear tubes are children who routinely suffer three or more ear infections during a six-month period or those who go through a total of four or more in the course of a single year. Because this kind of frequency represents a danger to long-term health, it may be advisable to thwart the problem in its early stages. Other good candidates for ear tubes are children who routinely experience fluid buildup, which then causes hearing loss, whether or not an infection has taken place. 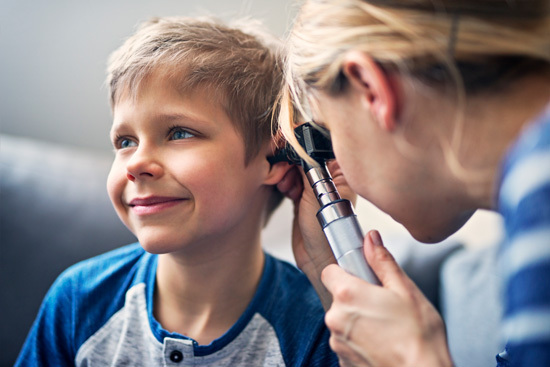 If your child has been given medication over a long period of time, or if several different programs of treatment have been prescribed without success, those are other scenarios where ear tubes may be the most viable treatment option. 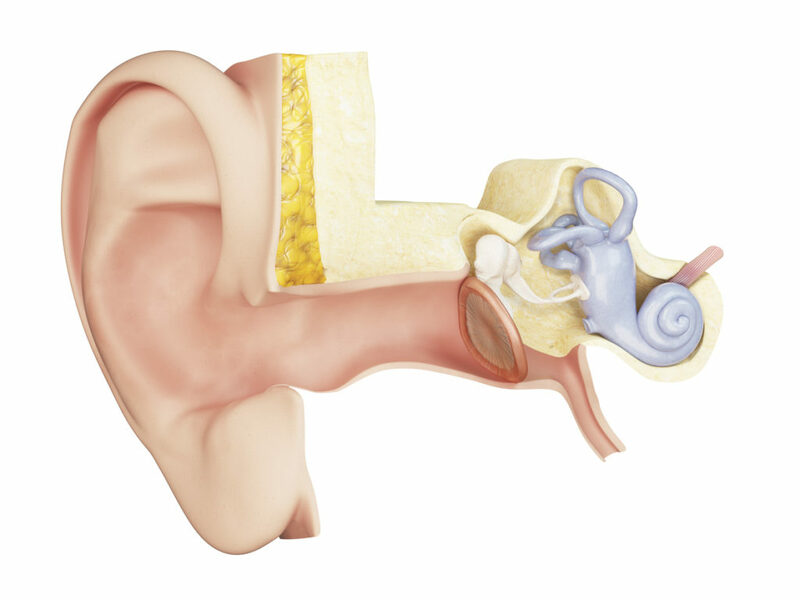 What Exactly are ear Tubes? The physical appearance of ear tubes is similar to that of a very, very small drinking straw, which means they are circular, hollow, and most often manufactured with plastic or metal. To insert the ear tube, your doctor will make a tiny opening in the child’s eardrum and then put the tube in, so that air is allowed to penetrate to the interior of the middle ear. This allows airflow into the ear and it maintains even pressure between the inner ear and the exterior environment. It also allows for better drainage, so between the better drainage and the better airflow, the fluid has much less chance to build up, and that means bacteria don’t have a chance to accumulate and develop into infections. For those children who have experienced hearing loss as a result of fluid buildup, the situation is cleared up almost immediately after ear tubes have been inserted. Children who have experienced delays in learning or social skills, generally improve within weeks of having the tubes inserted. For some children, ear tubes are meant to be a temporary solution, and these will remain in place for between six and 18 months. After that time, they’ll simply fall out harmlessly on their own, with no intervention necessary. 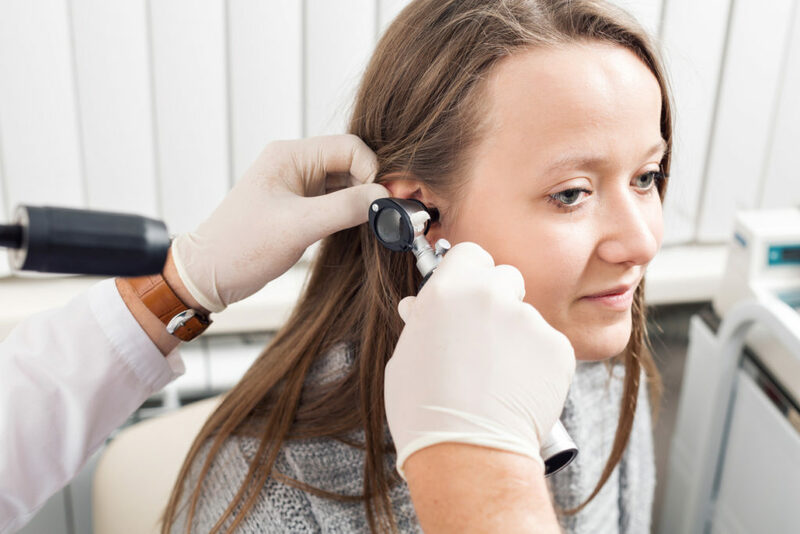 Other types of ear tubes are designed to be more of a permanent solution, and these generally need to be removed by a skilled doctor, if removal becomes necessary. In either case, once tubes have been removed, the eardrum opening gradually closes up all on its own. A great many children wear ear tubes these days, and all of them are benefiting to some extent by doing so. They are safe, effective, and can make a very positive difference in your child’s life. Ear infections are simply inflammations of the middle ear, and they are generally triggered by bacteria which accumulate behind the eardrum. People of any age can be subject to ear infections, but children have them at a more frequent rate than do adults. By the time of a child’s third birthday, five out of six children will have had an ear infection at least once, and that makes it the single most common cause for children to be taken to a doctor. One of the problems with this is that some children are just too young to verbalize what they are experiencing, and can’t really tell you that their ear hurts. In this situation, a parent should be on the lookout for symptoms that characterize an ear infection, such as pulling at the ears, balance problems, fevers, difficulty with sleeping, excessive crying, drainage from the ears, and non-responsiveness to quiet sounds. One of the most common causes of an ear infection in a child is an upper respiratory infection, a cold, or a sore throat. In the case of the upper respiratory infection, related bacteria can easily spread to the middle ear, and with a cold, the virus can be drawn into the middle ear as an offshoot of the main infection. In any of these cases, fluid begins to build up around the eardrum. The reason that children are more susceptible to ear infections than adults relates to the fact that the eustachian tubes in a child’s ear are smaller than an adult’s, and that makes it more difficult for any fluids to exit the middle ear, even in the absence of any kind of infection. When those eustachian tubes become swollen by a cold or other illness, drainage may slow down to almost nothing, and blockage will be the likely result. Complicating matters, the immune system for a child is not nearly as developed or robust as an adult’s, and that makes it much harder for children to fend off the effects of any kind of infection. 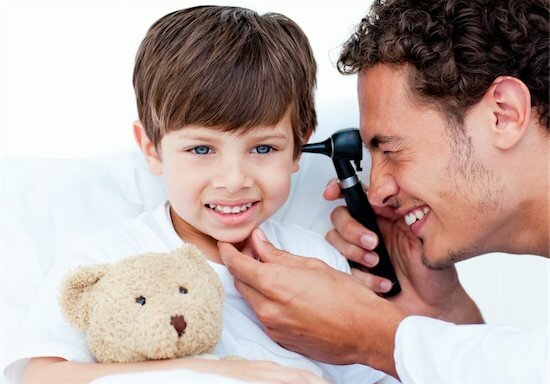 Your doctor will likely use an instrument called an otoscope to determine whether your child’s eardrum is red and/or swollen with an infection. When you take your child to see a doctor about a possible ear infection, the doctor’s first question will be about your child’s recent medical conditions. Your doctor will try and find out if your child has had a sore throat or a head cold recently. Then the doctor will ask about any of the other common symptoms associated with an ear infection, to see if your child has been experiencing any of these. 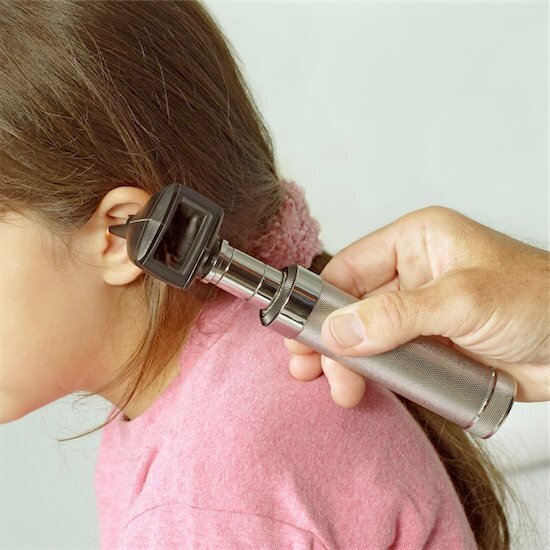 After gaining this kind of information, your doctor will probably use an instrument called an otoscope, which is a lighted instrument that can see inside the eardrum to determine whether it is red and/or swollen with an infection. If this is inconclusive, your doctor might then use a diagnostic test known as tympanometry to measure eardrum sensitivity at various points. One of the most common treatments for a middle ear infection is an antibiotic called amoxicillin, which is generally prescribed over a period of 7 to 10 days. If your child is experiencing an inordinate amount of pain or discomfort, your doctor may also recommend pain relievers such as ibuprofen or acetaminophen, and possibly even eardrops which can be delivered directly into the ear. In cases where an ear infection cannot be definitively diagnosed, your doctor may want to adopt a wait-and-see attitude about the condition, to see if it worsens into an actual ear infection. This is more common in very young children, between the ages of six months and two years. However, even when the wait-and-see approach is adopted, your doctor will probably ask to have your child returned within three days to check on whether symptoms have worsened. If definitive diagnosis is still lacking, it is likely that a program of antibiotic treatment will be initiated, to be sure it gets no worse. When antibiotics are prescribed, it’s very important that the child takes the prescribed dosage throughout the entire period of the prescription, so that bacteria do not have the chance to develop resistance to the medication. There is no rock-solid way to prevent middle ear infections in children, and the best approach that can be adapted calls for limiting the risk factors which may trigger an ear infection. Vaccinating your child against influenza is one good track to take, and limiting your child’s exposure to children known to be sick is a good idea as well, although obviously this is not 100% enforceable. Good hygiene for everyone in the household is important: for instance washing hands and sneezing into your elbow, to help prevent the spread of germs to your child. It’s not a good idea for anyone in the household to be smoking, and statistics bear out the fact that where at least one person at home smokes, there are more ear infections than in smokeless homes. One last method of limiting the risk factor for developing ear infections is to make sure that your infant is never put down for a long period of time, such as overnight, with a bottle in hand. It may look like a mouthful to say, but the medical condition known as benign paroxysmal positional vertigo (BPPV) can easily be understood by breaking it down into its constituent terms. Benign means non-life threatening and paroxysmal means that it occurs only in sudden bursts. Positional means that it is triggered by specific positions or head movements and vertigo is a sensation of dizziness. Taken altogether, someone who has BPPV would experience brief periods of dizziness, which are brought on by abrupt, unanticipated head motions. Many of the issues which affect your balance originate in the inner ear, like BPPV. It starts when some of the calcium carbonate crystals which are normally carried in the gel of the utricle, somehow navigate out of that environment and into at least one of the three semi-circular canals, which are filled with fluid, and are thus also capable of hosting the crystals. These semi-circular canals depend on fluids to determine head motions, and when the fluids become oversaturated with calcium carbonate crystals, your ability to balance is disrupted. These particulates cause excessive movement in the fluids within your inner ear, creating what we commonly know as vertigo (dizziness). When this fluid moves, there are nerve endings inside the ear which sense that motion and transmit messages to the brain about head movements. Inaccurate signals are sent to the brain, and as a result, the BPPV patient feels dizzy and disoriented. Even though you might never have heard of BPPV, it’s not an exceptionally rare condition. In fact, more than 100 out of every 100,000 people in America are affected by BPPV, most of whom are adults. The disorder rarely impacts children, and is far more prevalent in older people, particularly seniors. The cause of the disorder is not yet understood, with most people reporting that they simply woke up one day, and as they got out of bed, realized that the bedroom was spinning all around them. Although the beginnings of BPPV are unclear, scientists and doctors have noted a correlation between the disorder and other diseases such as diabetes, osteoporosis, and inner ear infections. In diagnosing BPPV, ENT doctors look for nystagmus, which is an pattern of eye movements caused by the sensation of vertigo. It can be difficult to diagnose BPPV, because the movement of the calcium carbonate crystals does not show up on imaging scans such as magnetic resonance imaging (MRI). However, a BPPV can abruptly position their head in a way that causes the crystals to move within the fluid of the semi-circular canals, which triggers the false signals that induce dizziness. This dizziness causes the person’s eyes to move in a very definite and predictable pattern known as nystagmus. This occurs because there is a close relationship between the eye muscles and the inner ear, which allows for a person to remain focused on immediate surroundings during head movements. Because the false signals sent to the brain make it think the head is moving, it also mistakenly triggers eye movement, which is supposed to help maintain equilibrium. However, in this false scenario, nystagmus acts as a telltale sign. Sometimes medications are prescribed as a treatment for BPPV, and in other cases, surgical solutions are recommended. But in most cases, the most effective treatment by far is relocating the wandering calcium carbonate crystals back into the utricle chamber where they belong. The first step in this mechanical approach calls for identification of which semi-circular canal(s) the crystals have migrated to. Once that is known, a doctor will guide the patient through a series of head maneuvers which are designed to encourage the crystals to return to their original position. Self-treatment is not recommended, and it calls for a doctor who is skilled in guiding a patient through the proper maneuvers so that no damage is done to the head or neck areas. Studies have demonstrated that the success rate for properly diagnosed and guided BPPV treatment is around 90%. Once the calcium carbonate crystals have been returned to their proper position, most patients report no more than minor residual spinning sensations, and even these diminish within a couple of months. However, it is possible for the condition to recur, and come back in full force. This usually occurs within five years of treatment, and when it does come back, it can again be treated successfully, using the gravity method of guiding the crystals back to their proper position in the ear. Swimmer’s ear is something of a misnomer since you don’t have to be splashing around the pool or swimming to get the kind of ear infection attributed to swimmer’s ear. This ear infection is of a specific type which begins as a mild, barely noticeable itching or redness, which gradually escalates into an inflamed condition that can become very tender to the touch, and can eventually even disrupt your hearing. You can contract swimmer’s ear infection in any number of ways, including swimming in some body of water, but also by taking a bath or shower, or even by cleaning your ears out with a cotton swab. The formal medical name for swimmer’s ear infection is otitis externa, and it occurs when water gets trapped in your ear. When that water is allowed to stay there, bacteria and sometimes fungi can grow in the ear and multiply, which then leads to an infection near the opening of the ear. There are other causes of swimmer’s ear as well, which are not brought about by any exposure to water. If a cut or scrape occurs just inside the ear canal, that can also trigger the formation of the bacteria necessary to create an infection. Aggressive cleaning with cotton swabs is another relatively common cause of swimmer’s ear since the swab can scratch the skin inside the ear, and bacteria can begin growing and multiplying as a result. In fact, people with excessive amounts of earwax are prone to developing swimmer’s ear, as are people bothered by eczema, which is a chronic skin condition. As mentioned, the first indication of swimmer’s ear is usually a mild form of itching, often accompanied by redness and swelling around the ear. When the infection begins to progress, the area becomes more inflamed and more painful. Many people who have contracted swimmers ear report that it’s extremely painful, far beyond what you might expect from such a seemingly simple medical condition. Other symptoms can develop if swimmer’s ear is left untreated, some of which can be quite serious. Fluid build-up in the ear, swollen lymph nodes, a swollen or closed up ear, and a high fever are all symptoms that can result from an untreated ear infection. This damage is not permanent and will subside once the infection is cleared up with medication. The best thing to do if you have a swimmer’s ear infection is to seek the attention of your physician or ENT. They’ll be able to give you antibiotics you need to clear up the infection. Someone who has contracted swimmer’s ear infection should take a pain reliever like Ibuprofen if the patient cannot see a doctor immediately. In some milder cases, the pain and discomfort will subside on its own, but if that doesn’t happen within just a few days, it’s always advisable to make an appointment with a physician. If you can’t get an appointment to see your doctor for treatment, you should try to get into an urgent care facility and have the infected ear examined. To confirm a diagnosis of swimmer’s ear, a physician will take a fluid sample from the area around the ear, and the first treatment option will usually be antibiotic eardrops. If these don’t clear up the problem in a short timeframe, an oral antibiotic is likely to be the next option. There are times however, when this line of treatment is ineffective and something else has to be tried. If ear antibiotics don’t work, it’s usually because there has been so much debris or fluid built up in the ear canal, that antibiotic eardrops cannot penetrate the obstruction. If this is the case, your doctor may attempt to clear the debris out of the ear canal by using a vacuum apparatus. Once the buildup of debris has been dissipated, antibiotic eardrops will again probably be effective. One reason why oral antibiotics could possibly be ineffective as a means of treatment, is if the infection wasn’t really caused by bacteria in the first place, but was triggered by a fungus. You don’t have to avoid swimming, bathing, or showering in order to avoid swimmer’s ear infections. One of the most effective ways of ensuring that water doesn’t become trapped in the inner ear is to wear earplugs when swimming. After showers or baths, you can lean your body toward the side which feels like it has water trapped, and shake your head somewhat vigorously. This will usually dislodge any inner ear water, and clear out the ear canals. It’s also advisable to limit your cotton swab cleaning of the ears as much as possible, so you don’t scratch the interior skin and trigger an infection. “My Ear Hurts” is a statement that parents often dread. Immediately, you think ear infection. However, it is important that you don’t jump to conclusions. Before you start panicking, here are a few facts about ear infections that you should know to not only help your child but know when to seek help from a doctor or otolaryngologist. Most illnesses are caused by either bacterium of viruses. 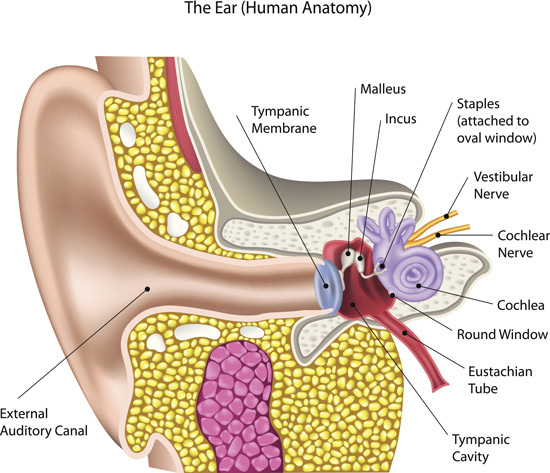 The eustachian tubes is a part of the body that drains fluids from the middle ear. When it is swollen due to infection, it doesn’t function properly. Fluid is instead pulled into the middle ear, causing bacteria to grow. Irritation during the day or night. Blood or pus in the ear. These symptoms are serious. Blood or pus coming out of the ear probably means a ruptured ear drum. The ear drums swell and can burst, especially if your child messes with it. Now, this can heal, but a professional can tell you what to do so it heals properly. If the pain is too great or your child cannot hear, then visit your doctor or an otolaryngologist. You shouldn’t wait for their temperature to go down. Ear infection can also be the cause of a fever and stiff neck. Home treatment only works so much, and very little if your child’s condition is severe. Hopefully, this helps you find the signs of an ear infection. Next week, find out how to prevent an ear infection from occurring. Sometimes, hearing loss can occur because of a variety of reasons: buildup of earwax, an ear infection, or even exposure to loud noises. Many people believe having a little trouble hearing every now and then is a minor inconvenience, and that the condition is only temporary. However, a new study suggests the sound deprivation can lead to irreversible hearing loss. How Is Sound Deprivation Affecting Hearing? When sound’s ability to travel between the ear canal and the inner ear is damaged, conductive hearing loss occurs. Sounds and voices will seem faint or muffled to anyone suffering with the disorder. In the study, performed by the Massachusetts Eye and Ear Infirmary, scientists wanted to be able to determine what happens to people with a recurring case of hearing loss. By testing mice dealing with chronic conductive hearing loss in one ear, they were able to determine that sound deprivation causes irreversible damage to the inner ear. “After a year of sound deprivation, we observed dramatic changes in the inner ear – notably, a significant loss of the synaptic connections through which the sensory cells send their electrical signals to the brain,” says Stephane F. Maison, Ph.D., lead researcher, investigator in the Eaton-Peabody Laboratories at Massachusetts Eye and Ear Infirmary, and assistant professor of otolaryngology at Harvard Medical School. What About Your Good Ear? Even with the damage from sound deprivation, some individuals feel that not being able to hear from one ear is not a situation worth fixing. For children with a common middle-ear problem, a new study reports that a simple treatment with a nasal balloon may diminish issues of hearing loss and avoid the unnecessary use of antibiotics, according to a study published in CMAJ (Canadian Medical Association Journal). Common to young children is their developing otitis media with effusion, aka “glue ear.” This condition occurs when the middle ear fills with thick fluid that may affect the development in hearing. Currently, no symptoms manifest themselves, so parents most often take their children with hearing difficulties to see a doctor. In 2004 in the US, 2.2 million were diagnosed with otitis media with effusion, costing an estimated $4 billion. Some kids are much more prone to glue ear because the tube that connects the ear to the back of the nose gets clogged from a sinus infection, allergy or even pollution-induced inflammation. “Unfortunately, all available medical treatments for otitis media with effusion such as antibiotics, antihistamines, decongestants and intranasal steroids are ineffective and have unwanted effects, and therefore cannot be recommended,” writes Dr. Ian Williamson, Primary Care and Population Sciences, University of Southampton, Southampton, United Kingdom, with coauthors. In the study published in the CMAJ, researchers from the United Kingdom surveyed a randomized control trial to determine if auto-inflation with a nasal balloon could be used on a large scale in order to see if children could inflate a balloon in each nostril within a primary care setting. The results were surprising in the effectiveness of such a procedure, although shown only in small trials. The nasal balloon has been around for decades, known as a home remedy. This treatment is similar to popping your nose when your ears get clogged on airplanes. The researchers suggest that this treatment should be used more widely in children over age 4 to manage otitis media with effusion and help treat the associated hearing loss. What’s important about this DIY therapy for autoinflation is that it’s a nondrug intervention, and that it’s underrepresented in research and clinical practice. If you’re child suffers from otitis media, ask you doctor about this simple procedure that has been around for decades. While there are barriers to using nondrug therapies, in the case of autoinflation, doctors need to know about other effective techniques; how they are done and how to instruct patients and families in how to use it.